Exploring the cultural lives of African slaves in the early colonial Portuguese world, with an emphasis on the more than one million Central Africans who survived the journey to Brazil, James Sweet lifts a curtain on their lives as Africans rather than as incipient Brazilians. 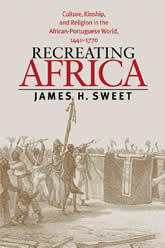 Focusing first on the cultures of Central Africa from which the slaves came–Ndembu, Imbangala, Kongo, and others–Sweet identifies specific cultural rites and beliefs that survived their transplantation to the African-Portuguese diaspora, arguing that they did not give way to immediate creolization in the New World but remained distinctly African for some time. Slaves transferred many cultural practices from their homelands to Brazil, including kinship structures, divination rituals, judicial ordeals, ritual burials, dietary restrictions, and secret societies. Sweet demonstrates that the structures of many of these practices remained constant during this early period, although the meanings of the rituals were often transformed as slaves coped with their new environment and status. Religious rituals in particular became potent forms of protest against the institution of slavery and its hardships. In addition, Sweet examines how certain African beliefs and customs challenged and ultimately influenced Brazilian Catholicism. Sweet’s analysis sheds new light on African culture in Brazil’s slave society while also enriching our understanding of the complex process of creolization and cultural survival.